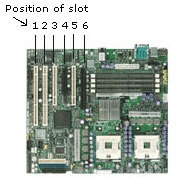 Picture shown identifies the PCI/PCIe slot position on a 6-slots ATX server board. From left-hand side are PCIX-64 slot-1, PCIX-64 slot-2, PCI-32 slot-3, PCIe x4 slot-4, PCI-32 slot-5, and PCIe x16 slot-6 which is lined up with the three horizontal cutouts of the chassis. PCIe x16 slot is backwards compatible to PCIe x8, x4, x1 interface. 1U 1-slot PCIe X16 reversed riser card, x16 right-angled female to x16 male. 1U PCIe x1 riser card, right-angled female to male connector. slot center height=1.06"
1U PCIe x4 riser card, right-angled female to male, slot center height=1.06"
1U PCIe x8 riser card. right-angled female to male, slot center height=1.06". Use ARC1-PEX8R for reversed insertion. 1-slot PCIe X16 riser card, right-angled female to male, slot center height 2".For expansion of add-in card to face away the board. PCIE 2.0/3.0 compatible. 1-slot PCIe x16 reversed riser card, right-angled female to male, Slot center height 2", good for Mini-ITX board and slim case for expansion of add-in card to face over the board.PCIE 2.0/3.0 compatible. 1U PCIe-to-PCI bridge-based active riser card with PCI-32 female and PCIe x1 male connector to the board PCIe slot(PCI riser slot offset 0.5" for Intel 1U rack sysem). 1U PCIe-to-PCI/PCI-X bridge-based active riser card with PCI/PCI-X female and PCIe x1/x8 male connector to the board PCIe slot(for standard 1U chassis). PCIE-to-PCI bridge-based active riser card. 2-slots PCI-32 right-angled female to PCIe x1(or mPCIe)male connector with 7cm/9cm/13cm ribbon cable. 1-slot PCIe x16 flexible riser card, right-angled female to male connector with various lengths of ribbon cable (3cm,5cm,7cm or 10cm). PCIe 3.0,Gen3 compatible. 1-slot PCIe X16 reversed flexible riser w/custom lengths ribbon cable. PCIe 2.0 Gen2 compatible. PCIe x1 flexible extender, right-angled female to male connector with various lengths of ribbon cable, cable lengths from 7cm(2.75") to 50cm(19.75"). Adapter riser, mPCIe male to PCIe x1 straight female, w/15cm(6"), 23cm(9")ribbon or custom length ribbon. fold the ribbon to provide offset and to the left or right or any orientation. 1-slot PCIE x4 flexible riser with various lengths ribbon cable, right-angled female to male connector. Re-direct female connector to face away or over the board. with short PCB, good for slim case. PCI Express X16 flexible riser card with 10cm(4") EMI shielded ribbon cable. PCIe 2.0/3.0 compatible. Bifurcated/trifurcated riser, splitting from single PCIe x16 to dual or triple PCIe x16(x 8/x8 or x8/x4/x4), PCIe Gen3 compatible. Fixed or flexible, either to face over or away the board for 1U/2U or custom chassis. PCIe x1 flexible riser, straight female to male connector, with various lengths of ribbon cable. Re-direct the female connetor to face over or away the board. PCIe 2.0/3.0 compatible. 1-slot PCIe x16 flexible extender, straight female to male connector w/11cm or 15cm(6") ribbon cable(up to 30cm). PCIE 2.0 Gen 2 compatible. 2U 1-slot PCIe x16 riser card. Goldfingers can be configured to x1, x4 and x8. Slot center height=1.85". PCIE 2.0/3.0 Gen2/Gen3 compatible. 2U 1-slot PCI Express X8 riser card. Slot center height=2.61"
2U 1-slost PCIe x16 straight-plug riser card, good for 1-slot PCIe x16 expansion on board slot7, slot center height=2.61". PCIe 2.0 Gen2 compatible. 2U 3-slots PCIe/PCI combo riser card for 1-slot PCIe x1 on board slot6 and 2-slots PCI on board slot5 and nearby slot. 2U up to 3-slots PICE riser card w/various lengths of flexible cable. Slots and connector can be configured to PCIE x1,x4 x8 and x16. 2U 3-slots PCIX-PCIe combo riser card for Intel SE7230NH1, SE7221BK1, S3000AHLX w/adaptive slot. 2U 3-slots PCI-X/PCI-E x8 combo riser card for 1-slot PCIe x8 on board slot6 and two PCI-X(same bus) on board slot5 and nearby slot. 2U 3-slots PCI/PCIe x8 combo riser card for 1-slot PCIe x8 on board slot6 and two slots PCI-32 on nearby slot. 2U 3-slots PCI-X/PCI-E x8 combo riser card for 1-slot PCIe x8 on board slot6 and two PCI-X(same bus) on nearby slots. 2U 3-slots PCI-X/PCIe combo riser card w/various lengths of ribbon cable for 1-slot PCIe x8 on board slot6 and two PCI-X(same bus) on nearly by PCI-X slot. 2U 3-slots PCIX/PCIE combo riser card for 1-slot PCIe x8 on board slot6 and two slots PCI-X independent connection on nearby slots on board. The "Cx" refers to various lengths of ribbon cable. 2U 3-slots PCI/PCIe x16 combo riser card for 1-slot PCIe x16 on board slot6 and two slots PCI-32 on board slot5 and nearby slot. 2U 3-slots PCI-32/PCIe x16 combo riser card for 1-slot PCIe x16 on board slot6 and two slots PCI-32. The "Cx" refers to various lengths of ribbon cable connected to reach the nearby PCI-32 slots on board. 2U 3-slots PCI-X/PCI-E Combo Riser card for 1-slot PCIe x16 on board slot6 and two slots PCI-X(same bus) on board slot5 and nearby PCI-X slot. 2U 3-slots PCIX/PCIe combo riser card for 1-slot PCIe x16 on board slot6 and 2-slots PCI-X(same bus). The "Cx" refers to various lengths of ribbon cable connected to reach the nearby board PCI-X slots. nearby PCI-X slots. The "Cx" refers to various lengths of ribbon cable. 2U 2-slots PCI-X/PCIe x16 combo riser card for 1-slot PCIe x16 on board slot6 and 1-slot PCI-X 64bits on board slot5. 2U 3-slots PCI-32/PCIe x16 combo riser card for 1-slot PCIe x16 on board slot7 and 2-slots PCI-32 on board slot6 and nearby PCI-32 slot. 2U 3-slots PCI/PCI-E x16 combo riser card for 1-slot PCIe x16 on board slot7 and 2-slots PCI-32 on board slot6 and nearby PCI slot. 2U 3-slots PCI-E/PCI combo riser card for 1-slot PCIe x16 on board slot7 and 2-slots PCI-32. The "x" refers to various cable lengths to reach the board PCI slots. 2U 3-slots PCIX/PCIE combo riser card for 1-slot PCIE x16 on board slot7 and 2-slots PCI-X on board slot6 and slot5. 2U 3-slots PCI-X/PCIe combo riser card for 1-slot PCIe x16/x8 on board slot7 and 2-slots PCI-X on board slot6 and slot5. 2U 3-slots PCI/PCIE combo riser card for 1-slot PCIE x16 on motherboard slot-7 and 2-slots PCI-32 independent connections on nearby board PCI-32 slots. 2U up to 3-slots PCIE/PCI combo riser card for expansions of board PCIe slot7, slot6 and nearby slot. PCIe slots and goldfingers can be configured to either x1, x4, x8 or x16. The affix "X" refers to Series of different combinations. Please see the ordering information. © Copyright 2005 Ameri-rack Technology,Inc. All rights reserved.